The Elmhurst Public Library is proud to present One Book, One Community, a public reading program that you can join. 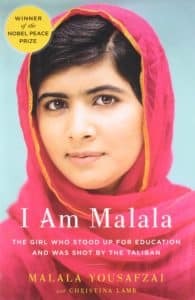 Library staff took a poll of Elmhurst residents to see which book the community wanted to read this summer, and the top pick was “I Am Malala” by Malala Yousafzai. You can meet with other readers to discuss the book at the library on Thursday, July 12 or Tuesday, July 17. At Elmhurst Toyota, we’re big supporters of our public library system and encourage you to participate in the One Book, One Community program. In “I Am Malala,” Yousafzai tells her compelling story. She was a young student in Pakistan’s Swat Valley when the Taliban took control of the area. Under the Taliban, girls were denied the right to an education. Yousafzai bravely spoke out against the regime. As a result, she was shot by the Taliban while riding in a school bus. She was just 15 years old. Yousafzai wasn’t expected to survive her injuries, but she miraculously recovered and became a fierce advocate for girls’ education. In addition to writing her book “I Am Malala,” she started the Malala Fund with her family to help girls attend school. At the age of 17, Yousafzai was the youngest person ever to win the Nobel Peace Prize. She is currently studying economics, politics and philosophy at Oxford University and continues her outspoken support of girls’ rights to receive an education. If you’re interested in participating in One Book, One Community, you must register for the program with your valid EPL card, either in person at the Elmhurst Public Library or by calling 630-279-8696. “I Am Malala” is available at the library in print, as an audiobook, digitally or via Playaway. Younger readers can read storybooks or watch downloadable or streaming videos based on the book. Time is running out to participate in the One Book, One Community program, so be sure to register soon! Visit https://bit.ly/2m61nOY or call 630-279-8696.